An e-way bill is a permit needed for inter-state and intra-state transportation of goods worth more than Rs. 50,000. It contains details of the goods, the consignor, the recipient and the transporter. It can be electronically generated through the GSTN. The e-way bill has been made mandatory for inter-state supplies from April 1, 2018 and for intra-state supplies from April 25, 2018 in certain states (Arunachal Pradesh, Madhya Pradesh, Meghalaya, Sikkim, and Puducherry). The bill can be issued from the GSTN. 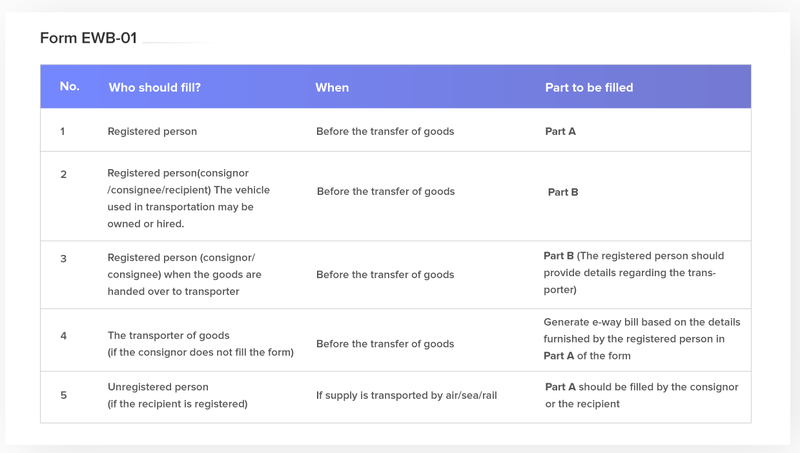 Once it’s generated, the supplier, the recipient, and the driver involved in transportation of the goods will be provided an e-way bill number (EBN). Alternatively, the supplier can generate and cancel e-way bills through SMS, if they do not have access to internet. However, to initiate this process, the supplier should first log on to the GSTN portal, and choose the ‘For SMS’ option from the ‘Registration’ tab on the dashboard. Note: If the consignment contains both – exempt and taxable goods, the value of exempt goods is excluded from the value of the consignment.